Most recently Dr. Paulette Kouffman Sherman was featured in the Huffington Post. 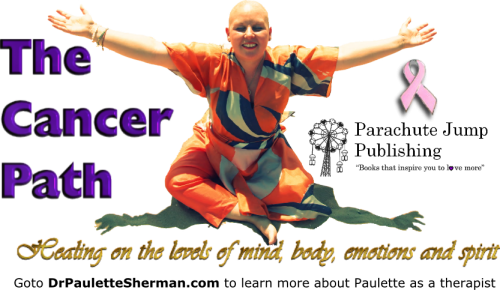 It includes her interview about her cancer “The Loud Voice of Cancer” with her video interview attached. Newest video interview about Dr. Sherman’s fight with cancer. It can be found on the website: “Power Living: Practical advice for living a purposeful & powerful life” along with the full blog, “The Loud Voice of Cancer”; hosted and written by Dr. Teresa Kay-Aba Kennedy. Or you can see them each detailed in my Cancer Path video blog. Downloads available for the Press. Introduction of Paulette Kouffman Sherman. You may want to download this one page document. This is the updated version of Dr. Sherman’s Press Kit. It is 17 pages long. It includes all of her blogs and published columns and articles. 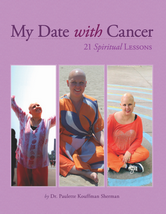 More details on the 4 book “The Cancer Path” series here. 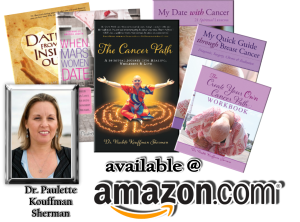 Dr. Sherman offers 15 suggestions for you to get the most out of an interview with her on her Four Book Series about The Cancer Path. Volume 1- is The Quick Essential Guide to Breast Cancer: Diagnosis, Surgery, Chemo & Radiation. Dr. Sherman offers 12 cancer topics for interviews and speaking engagements that are not directly related to her Cancer Path books. Paulette counsels individuals dealing with the emotional and spiritual affects of being diagnosed and receiving treatments for this disease. To see the articles Paulette wrote or was quoted in, her TV and radio appearances and more, click here.